First of all, please accept our apologies for the delay in posting recently. Unfortunately, life sometimes has a way of interfering in even the best laid plans, but rest assured, your team of geeks are still standing strong and ready to deliver some goodies for you! Well, summer season is well and truly in full swing as far as our entertainment goes, although the London weather seems to be determined not to ‘play ball’. I find myself travelling to my day job with a winter coat and a t-shirt, I kid you not! Given my carcass more resembles Samuel L. Jackson’s Nick Fury then Luke Cage, it’s probably not a pleasant sight for my fellow commuters when I whip my top coat off to reveal a body very much built for sitting down and watching movies and TV all day long. Speaking of Nick Fury, unless you have been living under a rock for the past 4 months, it won’t have escaped your attention that a little film called Avengers Age Of Ultron had it’s official UK release this week. If you can remember my previous post, you’ll know that I listed the film as one of the things I was most looking forward to this year. In fact, to say I was looking forward to this film was a bit of an understatement. From the moment tickets became available, I rushed online to secure my seat at the cinema. If it wasn’t for work commitments, I would have gone to a midnight showing, but ultimately I settled on seeing it the very next day. They say that expectation leads to the mother of all disappointments. 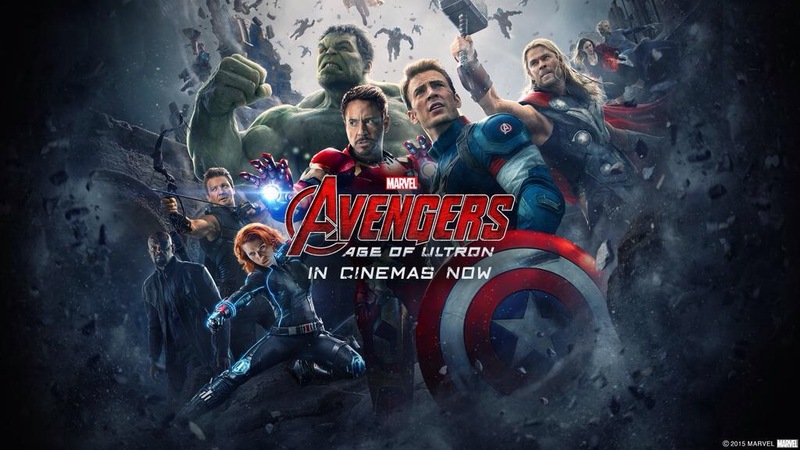 Well, whilst Avengers Age Of Ultron left me with a few minor grumbles, it’s pretty far from a disappointment. It’s actually bloody great and the fact that I didn’t find it as brilliant as the 1st movie is hardly a huge complaint, and I still left the cinema with a huge cheesy grin slapped across my face. The movie kicks off, quite literally, in the midst of a heated battle as our heroes attack what appears to be the last remaining stronghold of H.Y.D.R.A in the fictitious nation of Sokovia, and the action barely lets up throughout. The set pieces in this movie are huge and actually manage to surpass the incredible thrills of the 1st film. Most of the characters are well served by the script and it was great to learn more about Hawkeye and Black Widow, with Hawkeye in particular emerging as a well rounded, fully fledged human being. Speaking of the script as a whole, I enjoyed it, although a couple of the quips felt a little bit forced to me, which surprised me as generally I’m a big fan of Marvel Studios use of humour and lighter moments to break up some of the tension. There is a particular key scene in the film that hints at future movies, specifically Captain America Civil War, which ends with a joke that felt inappropriate, given the brevity of the situation the characters were in, and what we as fans know is coming next for this group. Though it can be argued that one of the characters involved in the scene would use humour in almost any situation, it still felt to me that we as an audience had been teased with something great only to have it snatched away at the last minute. On 1st viewing the film, I wasn’t hugely impressed by the character of Ultron. He seemed to me to come across as petty and childish. However, on my 2nd viewing of the film (yes, i’ve seen it twice, i’m a geek what can I say?) I realised that this had been the intention of the filmmakers all along and I began to appreciate some of the nuances of the character. James Spader’s vocal work is astonishingly good and he provides Ultron with a real sense of menace, even if he isn’t quite the intellectual despot he is in the comics. The major players in the cast are as reliable as always and Thor in particular has some very funny lines and sight gags that help to further humanise his character, though it is slightly distracting he spends a good portion of the film basically building his storyline for Thor Ragnarok. He is given a key role in introducing The Vision. That scene was one of the standouts for me, along with Iron Man and Hulk’s confrontation, but the scene I enjoyed the most featured no action at all. A revealing conversation between Black Widow and Bruce Banner halfway through the film was a rare moment of subtlety and gives a true showcase of the wealth of acting talent on display. The Vision’s introduction to the Marvel Cinematic Universe is handled really well and he already feels like a great addition to the Avengers line up. There’s also a few crowd pleasing cameos for new and existing characters that are tremendous fun. The twins of Quicksilver and Scarlet Witch are both fine, although I began to find both of their fake east European accents irritating. Why can’t Hollywood seem to find decent vocal coaches?? All in, Avengers Age Of Ultron is a real thrill ride. Though the film is over 2 hours long, there was never a point where I felt bored or distracted. It manages to balance explosive action set pieces with genuine character development for some. Despite there not being as much in the way of Civil War easter eggs as I would have liked, there is still plenty going on to keep die hard fans and newbies hooked. PS: I’m not sure if it was just my screening, but the 3D rendering on this film was very distracting at times. On my 2nd viewing, I saw the film in 2D and can honestly say I lost nothing for the experience. If you’re a dyed in the wool 3D fan, then by all means go for a 3D showing but I would recommend seeing the movie in 2D, just to appreciate some of what’s happening!